How HubSpot users can monitor the performance and impact of their email marketing at a glance. HubSpot’s email marketing and marketing automation tools are extremely powerful. For many users, it’s capabilities and analytics are overwhelming. But, it hasn’t always been that way. In 2007, I joined HubSpot as the 15th employee. Before I joined, my business partners and I had built an email marketing tool and tried to sell the company to HubSpot to incorporate into HubSpot’s all-in-one marketing software solution. The response from HubSpot co-founder Dharmesh Shah was, “We won’t ever offer email marketing. We’ll leave that to companies like Constant Contact and Exact Target”. Years later, HubSpot launched email marketing. The first version sucked. It was so bad, we had a flowchart that helped our salespeople determine when and when not to sell it. There were times when we had hoped Shah had stuck to his original guns of leaving email marketing to others. But, after continuous improvement that continues to today, HubSpot has an extremely robust solution for email marketing and marketing automation. According to G2Crowd, HubSpot is the best — the highest performing platform as rated by its users and the marketshare leader. TrustRadius shows HubSpot among the top rated solutions too, with more user ratings than a handful of the other top providers combined and Capterra rates it as the second most popular marketing automation solution behind very small business marketing software pioneer, Infusionsoft. HubSpot clearly figured out email marketing. And they have a full range of analytics that allow you to determine performance of your individual batch email marketing campaigns, marketing automation workflows and blog notification emails. But, the tradeoff of it’s robustness is that sometimes it’s a bit overwhelming. Keep it simple when monitoring and reporting high level email marketing metrics. When it comes to analytics, sometimes a simple view is best, especially if you’re reporting to executives or clients. “If you want a simple report that shows the open rate, click rate and your email marketing’s impact on traffic and leads regardless of campaign type, Databox provides all you need,” says Mike Donnelly, founder of Seventh Sense, an email send time personalization software company. 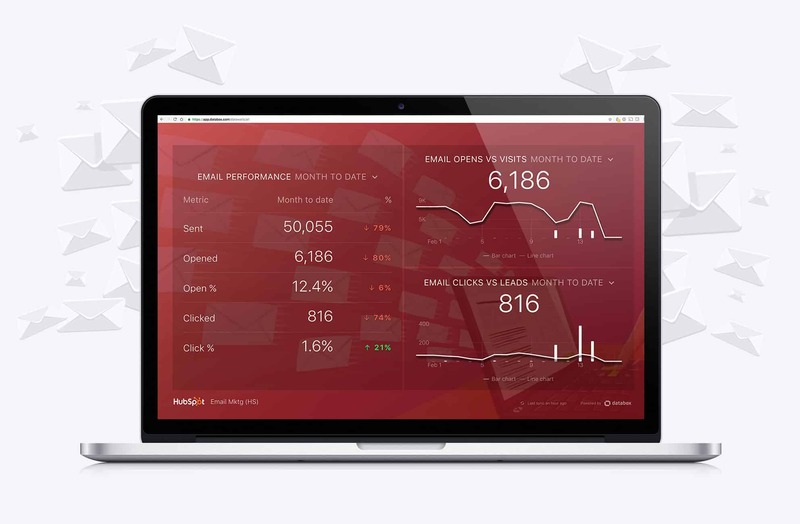 To make it a bit easier to see your high level stats, we worked with Donnelly to develop a simple dashboard that shows overall email marketing performance for a HubSpot customer. On the datablock on the left, you can see the number of messages sent, opened and clicked. More importantly, you can see whether your performance is better or worse than last month by looking at the % change column. A down arrow in a red font means your performance is worse compared to the previous month. A green arrow means you’re doing better. The number in the percent change column instantly tells you how far behind or ahead you are. If your goals are quarterly or weekly or you want to look at annual performance, you can do that too. The lovely thing about email marketing is that it’s pretty easy to make your arrows go up and green by sending another campaign. “Just make sure you’re investing in growing your list and not relying on additional sends every month to hit your goals,” says Donnelly. Focus on how email marketing drives traffic, leads and sales. On the charts on the right of the dashboard featured above, we’ve plotted the correlation between traffic and email sends, as well as the correlation between email sends and leads generated. While there isn’t a clear correlation for every email send on the charts in the screen grab above, you can see that traffic and lead volume does spike for one or two of their recent email campaigns. “The purpose of email marketing should be to drive leads and ultimately sales. We evaluate our client’s sends against our ability to do that” says John McTigue, SVP and co-owner at Kuno Creative, a Diamond HubSpot partner and Databox partner. When reviewing your analytics, sometimes less is more. “Periodically, it make sense to analyze your effectiveness at the campaign level, so you can plan out future campaigns, tweak your marketing automation workflow rules and your blog editorial calendar. But, most of the time, you should just be focused on whether you’re performance is slipping and whether you’re achieving your goals.” says McTigue. If you’re a HubSpot user, and you’d like the report above enabled in your account, create a Databox acccount and connect your HubSpot account to it or login to your existing Databox account. Then, ask Databox support to send you the HubSpot email marketing report template above.